The weather is getting cold. Scallops need scarves. To make the sweet chilli sauce, Place all the sauce ingredients in a small saucepan, heat gently and stirring until the sugar dissolves. Set aside. Beat the egg york in a shallow plate, mix with the cooked noodles. Season the scallops with salt and pepper, wrap some noodles around them. Heat the deep-frying oil to 320F/160C. Deep-fry the scallops until the noodles became just golden brown. Drain on kitchen paper. Sprinkle with the chopped parsley. 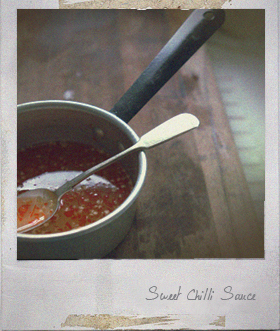 Serve the sweet chilli sauce in a dipping bowl on the side. 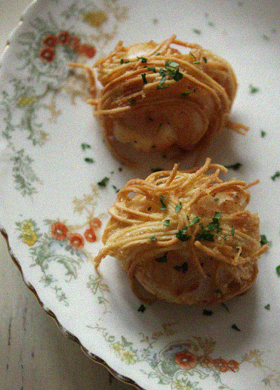 You are currently reading Crispy Noodle Wrapped Scallops at Fish Trip Cafe.